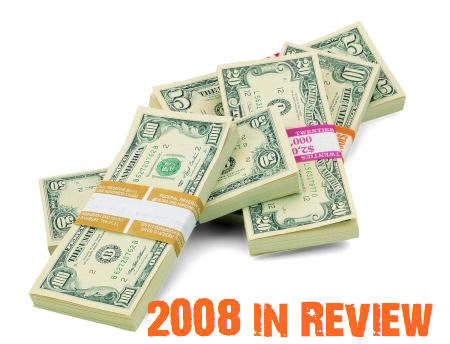 2008 was a very successful year for the blog, and myself in general. Traffic was up from this time last year by about 60%, as well as page views. From when I began Internet marketing in 2006, a lot has changed and business has picked up considerably. As far as income, which is the most important part, I’ve broken everything down into categories to show you exactly what I made during 2008… and how I made it. Most of my income comes directly from affiliate sales. I belong to about 10 networks and run campaigns on a daily basis. Most of my time is spent tweaking PPC keywords, creating landing pages and tracking to see what works and what doesn’t. If you don’t already belong to an affiliate network, read what to know before you join one and then check out my recommended money makers in the menu at the top of this page. Without blog sponsors, MoneyMakingScoop.com wouldn’t be profitable. When I first started the blog, I didn’t have any advertisements, but when I kept reading about the importance of monetizing your blog, I knew I had to do something about it. I began selling 125×125 ad blocks, and other various sizes of banners in early 2007. Since then I’ve had continued success using automatic PayPal subscriptions to keep track of each advertiser, and to make billing hassle free. If you’re interested in getting the word out about your business or website, consult the advertising page. New Internet marketers frequently e-mail to ask me if I can coach them along one-on-one to help get them started in this business. I’m always happy to help out for free, but when it gets a bit more complicated, such as outlining the certain strategies I use, there needs to be some money exchanging hands. I also spent quite a bit of time this year consulting businesses on SEO and how to make the search engines work in their favour. Because businesses can write consulting off as an expense, they tend to use my services more than they probably need to — which is fine by me. My first job online was designing websites. This is how I started to make an income via the Internet in early 2000. Since then, I’ve put this on the back burner for a while, and only do 3-4 projects a year, which only take a few weeks each to complete. I charge the standard industry rate as to what other designers are asking for, so it’s still very good money for not too much work. Chris Jacobson’s Money Making System continued to do well in 2008. The introductory price was $9.99, but later jumped to $28.50. I probably could have sold more copies of this if I spent more time marketing it. Hopefully in 2009 I’ll create a campaign for the eBook to really start pushing it. Because all of my income is generated in U.S. funds, it’s even more in Canadian due to the low dollar, which is always an added bonus! My goals for 2009? To make even more money of course! If you want to keep track of what I’m up to during the new year, make sure you’re following me on Twitter and add me on Facebook. Wow, I had no idea you made so much 🙂 Good on you! I like how you’re doing alot of different things instead of putting all your eggs in 1 basket. Keep it up. I hit just under 100K in 2008 and I’m aiming for $115k this year. We’ll see how it goes. Congrats on an awesome 2008. You did really well for yourself. I read alot about bloggers and net marketers earning good with PPC. But i have yet to try it. Gotta love the Canadian dollar. Nice!!! I wonder if i should be consulting too, instead of giving away what i have learned to those who ask. It is something i need to think more seriously about and consider. Congrats again on a fab year. wow, you’ve made good money for 2008, my prediction is you’ll double that in 09. good luck.